This blog has been set up to record and communicate the progress of the building of my new boat, a 8m (26foot) Norwalk Island Sharpie. In 2009, my wife Kate Burns bought me plans to the boat for 39th birthday. This year the timber was ordered. She gives good present! As a matter of history my first boat was a Heron with an unusual fully battened mainsail, it was a pig of a boat, the weatherhelm scarred me for life. I flinch any sign of an unbalanced rig, hence my second choice in boat. At the age of 17 I bumped into Duckflat Wooden Boats at the Mt Barker show. David Wilson’s “Ethel”canoe yawl was on display, and I fell in love with this gorgeous Victorian whimsical boat. After bugging Robert Ayliffe for a year and being turned away twice, I convinced him to let me build an Iain Oughtred Whilly Boat. 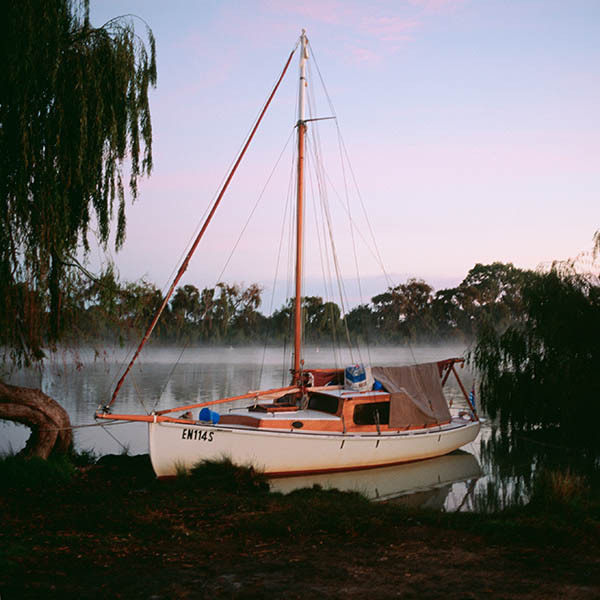 Erika took 18 months to complete, she was the first boat to come out of Duck Flat’s Grenfell Street premises. 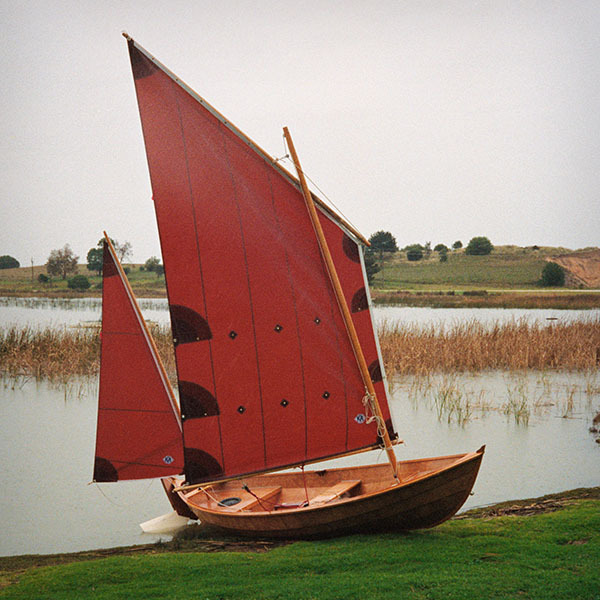 She is a very fast little (14’6″) boat, the original lug rig was modified by Michael Storer to a yawl, and carries quite a bit more sail than originally drawn. I have had her planing twice, back when I was fearless. Rooster tails out of the centre board case! The real beauty of Erika is her rig, that little mizzen sail does three very neat tricks; balancing out the rig in all conditions (absolute dream), holding the nose to wind when you want to put sailing ‘on hold’ (reef, lunch, read, rest, tea), and to make graceful arrivals and departures. The mizzen does a wonderful job of nudging Erika along when you want gentility. 20 years on from building Erika, and facing the new boat, I decided I had better do some maintenance on her. She is well used, but not mistreated, and does not look her age, which says everything for the epoxy ply building method. With that completed (took six months!) I can begin on the new boat. There has been another boat in my life. I had been seduced by a 28′ gaff cutter “Fresh Aires” designed by David Payne when I was in my late 20s. She was built at Goolwa at the Armfield slipway by Brian Read. She is a really traditional small yacht with a modern hull. I spent days and nights on board in her cosy skylit cabin, and sailing through all seasons. Fresh Aires played a key part in my courtship with Kate, and when it came to buying our first house, the money from her (the boat’s) sale helped with the deposit. Fresh Aires in now in Sydney, cutting up the harbour. I have been involved with many other boats, in both construction and sailing, I definitely have a boat fetish, I can trace it back to a well thumbed ‘Scuffy the Tugboat’ Golden Book. Considering boats, there is something supremely elegant about how form follows function, the prettiest boats are often the most effective. They are little cradles that carry their crew through calm and storm. To sail is to be a tight rope walker, you ‘feel’ when it is working, you hold it all in balance. Above all, there is the silence. I have just bought a Whilly Boat with no sails. Seems they were lost in a house move. I would be interested to know what the larger sail area was? Is the mast in the original position? People often mention the Whilly Boat is tender and imply perhaps a smaller sail area might suit her better, so your experience is good to hear. I am a very experienced small boat sailor, have owned many of Iain Oughtred’s designs so am looking forward to refurbishing the boat and seeing how she sails. My son and I were very impressed with the Tirrik we owned, she really needed to have two aboard. Hope the Whilly Boat is as good with one aboard. All the best with your new build. Hi Brian, no the mast is more forward and the sail area modified due to the mizzen. I believe Iain’s redesign of the Whilly Boat involved firming the bilges (a harder turn) and higher freeboard. Contact Robert Ayliffe if you want the correct sail sizes. If you are interested in my modified rig, Michael Storer is the person to contact. Google Storer Boat designs. All the best with the restoration! Love the look of your Whilly Boat. Contacted Michael Storer for the modified rig. He tells me he has to dig it up but maybe you have the design? I would of course work it out through Michael.. I just built the quick electric and want to build the original Whilly Boat . Any chance you still have the sail and rigging plan that you could send to Michael? Hi Stephen, I will dig for it. I did not throw it out, but we have moved many times since and I have not seen it for a while. Hi Randal, I sold it to a dentist in Sydney, she is cruising the harbour as far as I know. Robert Ayliffe handled the sale and delivered her.